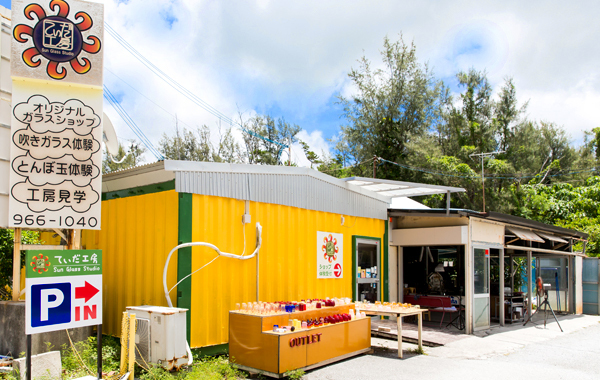 Teida Glass Studio is located in Onna village, Okinawa. All glasses in the shop are handmade by our passionate skilled staffs. We have Ryukyu Glass workshop in the factory and variety of colorful glasses at the shop for you to enjoy. Visit us to have a memorable Ryukyu Glass experience. Have a unique experience at our glass studio by making only glass in the world. The workshop only takes 15-30minutes. It takes a whole night to cool down your finished product. Your glass will be ready for you to pick up the next day. ※the blowing glass workshop is available from 5 years old. One of the staffs will be with you at all time for safety during the workshop. Staffs will support you to make your one and only Ryukyu Glass in the world. Pick a color for your glass. (Clear(transparent)/ Blue/ Light Blue/ Green/ Pink / Yellow/ Orange / Purple/ Brown). Teida glass studio is located along route 58 on the right side to the North of ANA Intercontinemtal Hotel for 200M. About 1 min from ANA hotel by driving. Take Route20 Nago West line or Route 120 Nago Airport line, then get off at Oota Kushibaru.